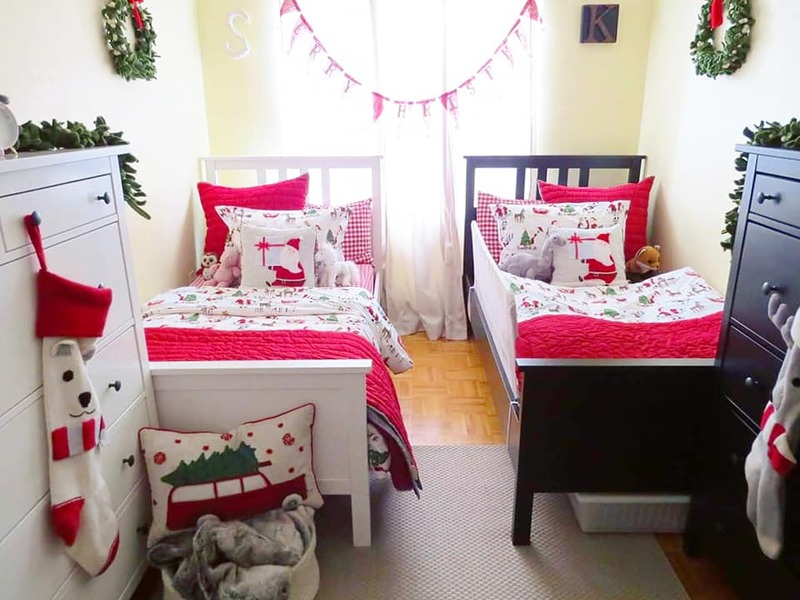 Last holiday season, Akshaya had casually mentioned that she would like to decorate her shared bedroom for the holidays. Obviously I though it was a wonderful idea but due to the lack of time, we didn’t do much. However, I kept my eye out for the Pottery Barn Kids holiday clearance sale so that I could purchase bedding for a decent price rather than splurging the following season. Sure enough I was able to purchase bedding for less than third of the regular retail price. I bought sheet sets, quilts, and duvet covers from the Canadian Pottery Barn Kids website and my friend was able to purchase the cushion covers from the United States and bring it over the summer. Acquiring the bedding was honestly the most difficult part. Everything else came together very easily. 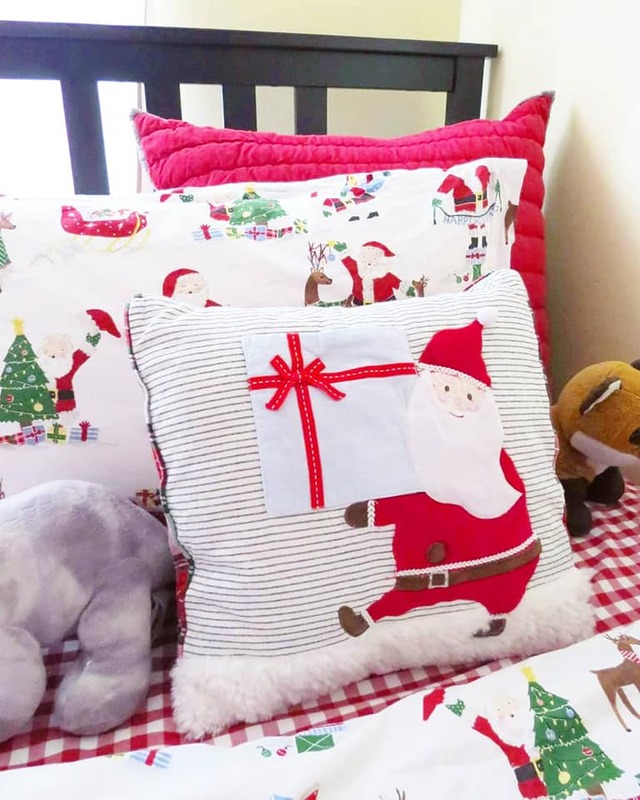 Rather than buying holiday-themed everything, I opted to buy only a Christmas-themed duvet cover. I completed the look with a red quilt and matching Euro pillow cover, and red-checked sheets. Both red items can be used later in the year coordinated with another print and even for Valentine’s Day. 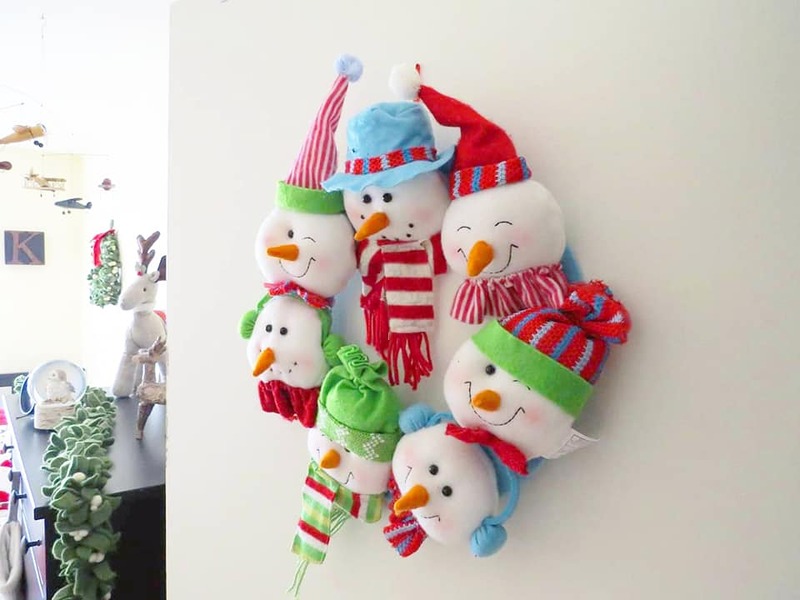 The holiday wreath, garland, and stockings were all purchased during the Pottery Barn holiday clearance sale. 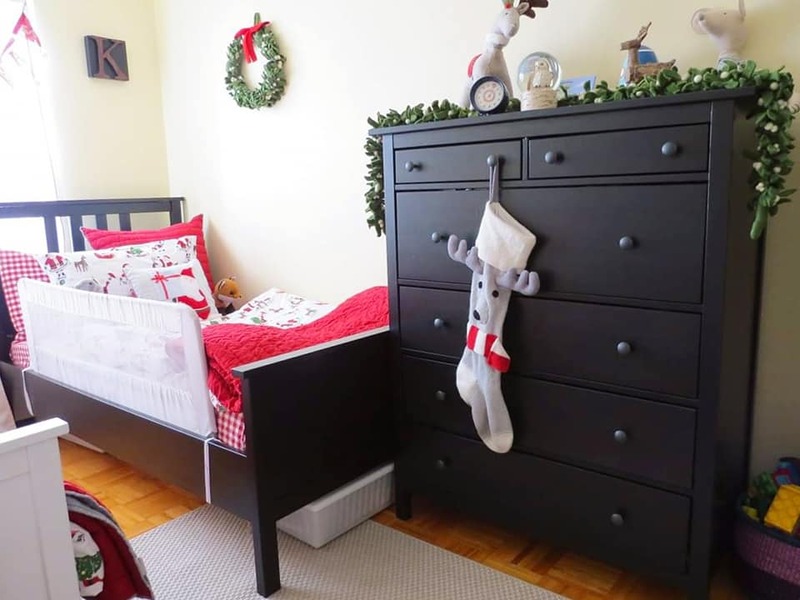 The wreath and garland are both made from a combination of wool and felt and can be hung but I chose to drape them over the children’s dressers. 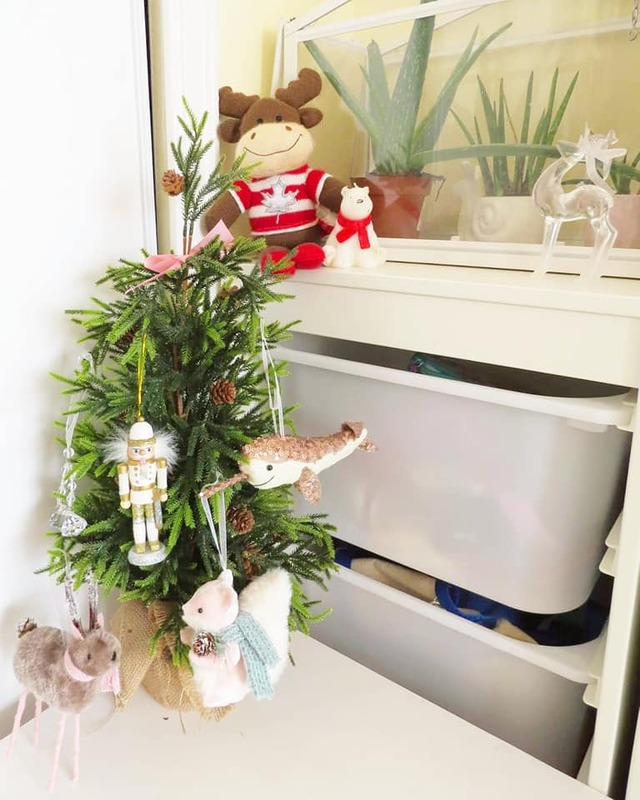 Akshaya and Udayan decorated the tops of their dressers with festive stuffed animals and a snow globe. 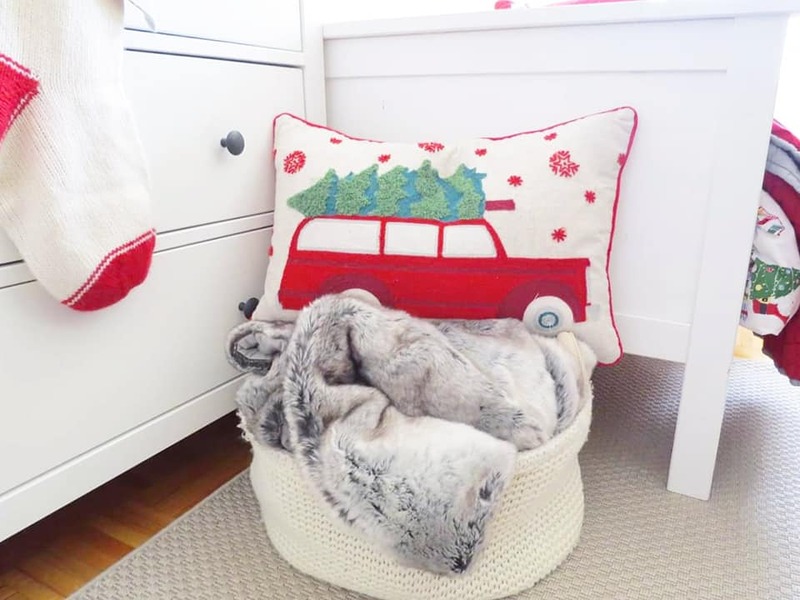 I added this knit basket purchased years ago from Winners, at the foot of Akshaya’s bed and filled it with a cozy fur throw. The fur throw was bought on sale from Indigo for my bed but the children claimed it as their comfy reading throw. My children spend a lot of time on the floor of the bedroom, reading, drawing, building lego, so I thought a throw and some pillows would be a nice addition for the colder months. This holiday themed pillow was an old purchase from Winners. When I purchase pillows and throws, I make sure that they are machine washable because life with kids is messy! Over the summer, we purchased a storage solution from Ikea. 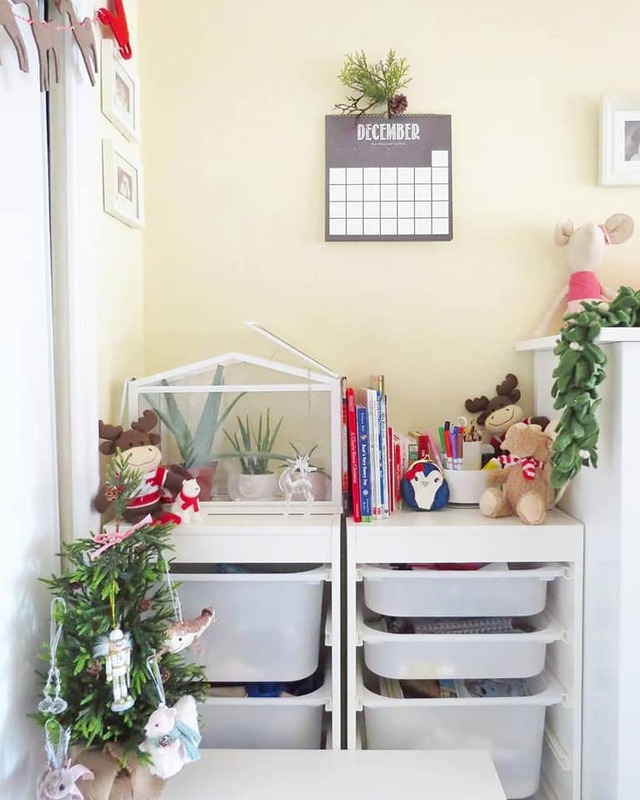 It has been a lifesaver in keeping the children’s things organized. 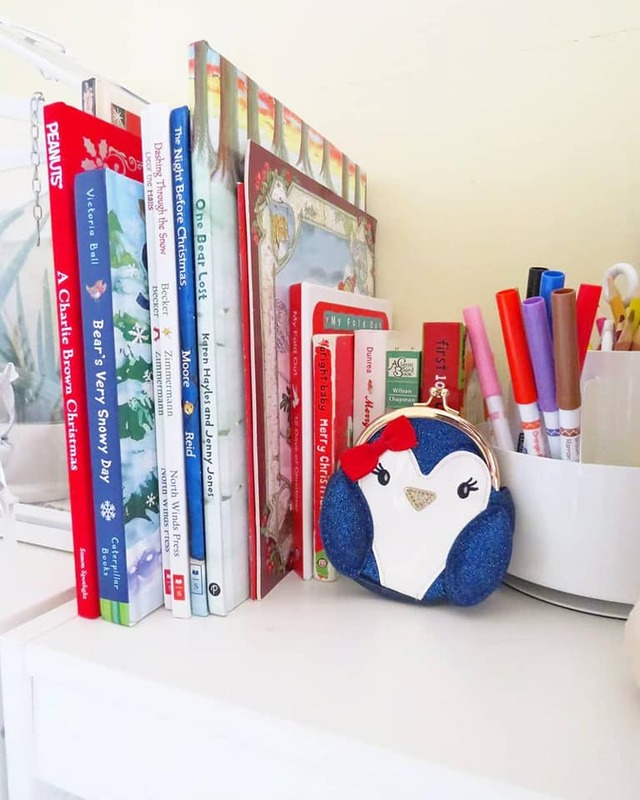 The top surface of this storage tower has sort of become home to a few things as well – plants, books, and small décor. Akshaya and Udayan stacked all of their holiday books in one spot so they will be easily accessible for bedtime reading. 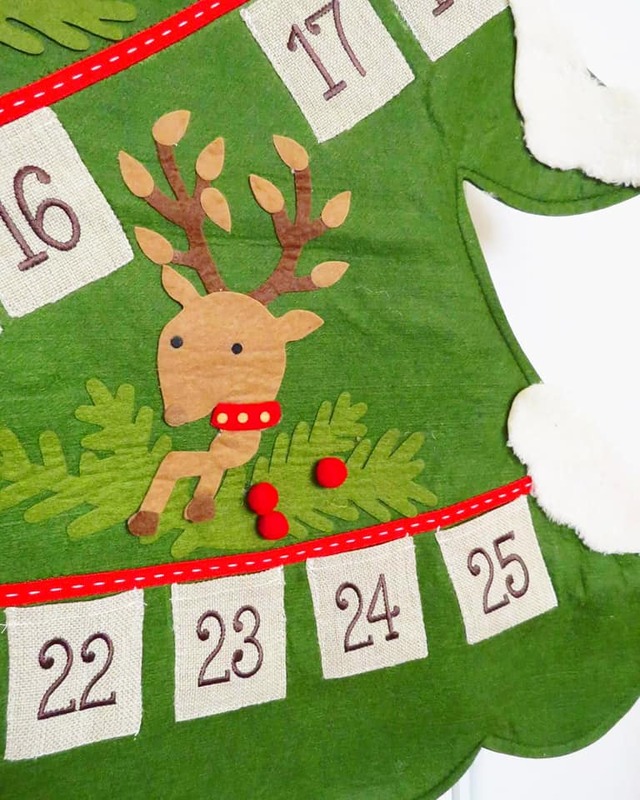 The chalkboard-like Calendar was purchased at Indigo. 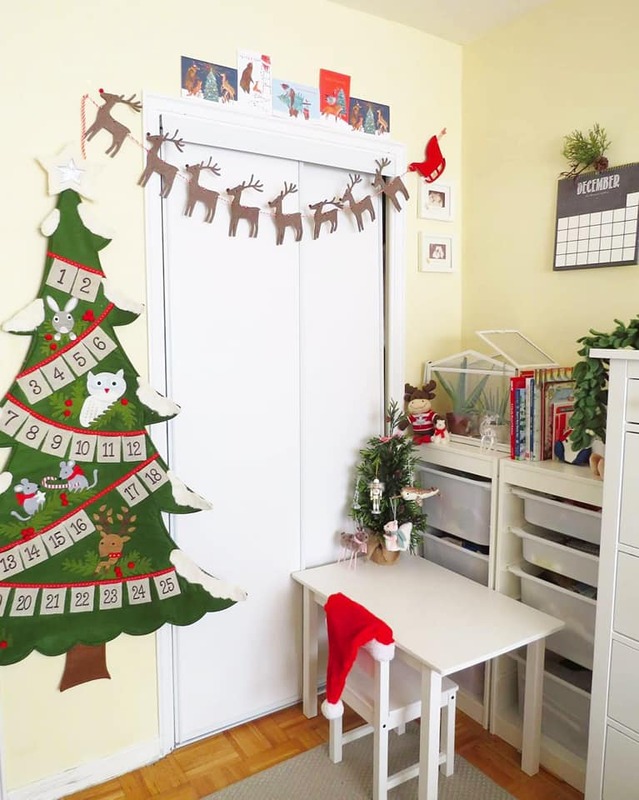 This little tree was an old purchase from Winners, which my daughter turned into a little Christmas tree with ornaments she purchased this year from the Real Canadian Superstore. 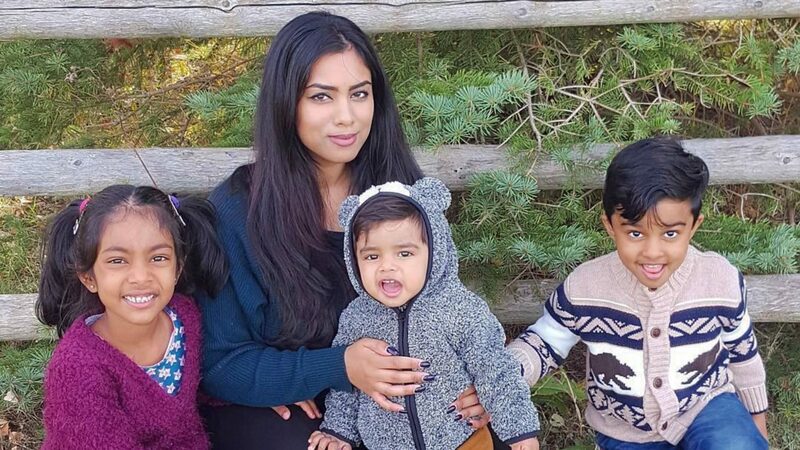 Technically this started off as Akshaya’s tree, however Udayan has hung a few dinosaur ornaments since this picture was taken. 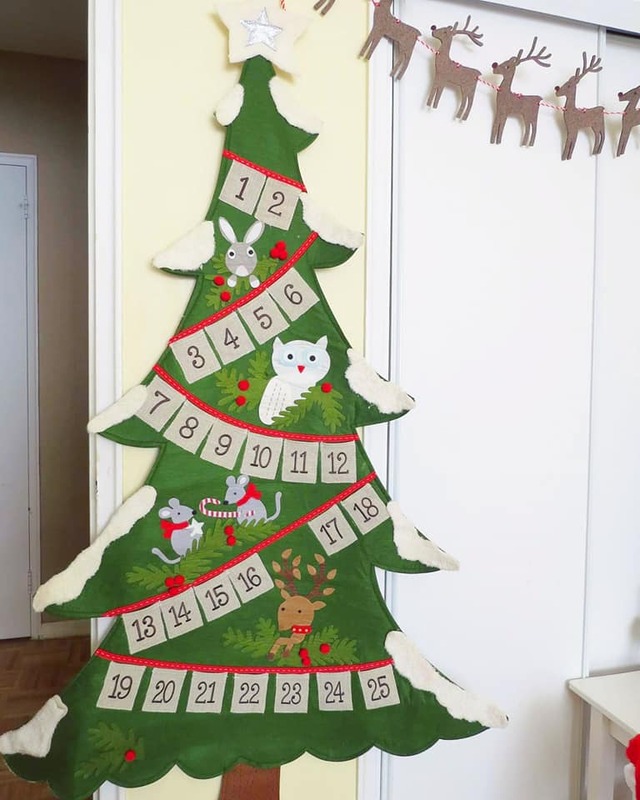 This felt advent calendar was one of my many purchases from Pottery Barn Kids. It was just too cute to pass up. 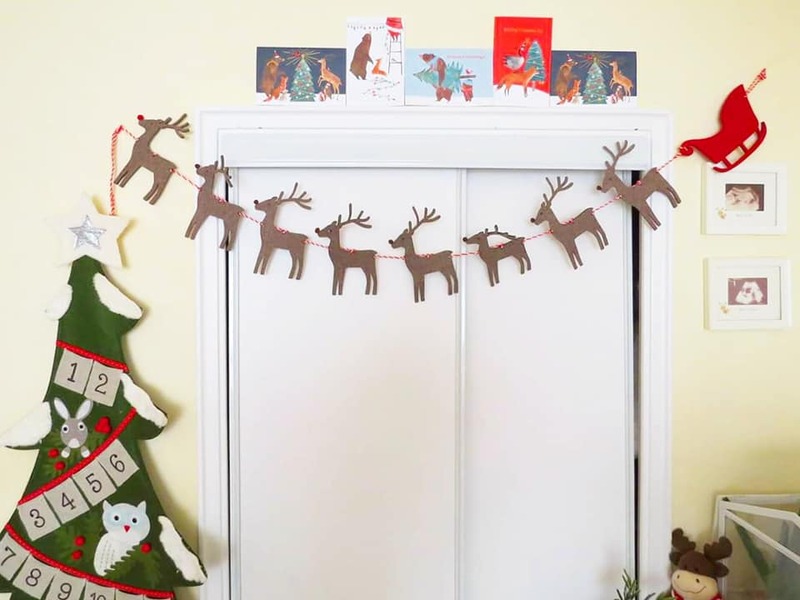 The top of the closet was decorated with a reindeer garland purchased last year from Michael’s Arts and Crafts store. Michael’s has many budget-friendly décor options as well as awesome sales and coupons. I also stuck some animal-themed holiday cards (this by the way is a great way to re-purpose cards). 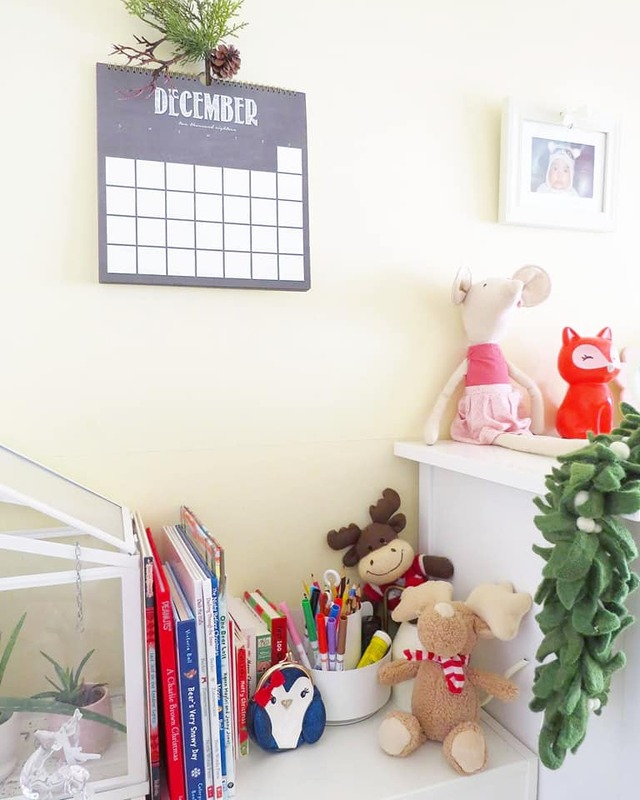 The children’s room is small but nonetheless it is quite a bright, cheery, and cozy space. They spend so much time in here so I was glad that I was able to add a few festive touches as per Akshaya’s wishes.